I was sitting in the balcony at a concert a couple weeks ago in this church-y venue and I loved how cool the chandeliers looked in the crazy lights from the concert. 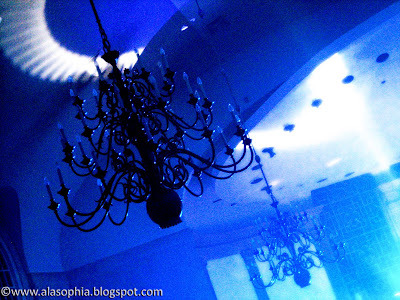 I seriously kept looking at the chandeliers instead of the band -- I have a thing for interesting chandeliers. I think the lighting and angle makes it look like it is underwater. Anyway, I took this shot really quickly with my tiny Canon Elph, zoomed in as much as possible, and hoped that the people behind me didn't think I was weird. This could've been better with my new digital SLR but that would have been harder to sneak past security in my purse. You're funny. I've never been distracted by a chandelier while at a concert, but I do get distracted by the people around me. They don't make for such great pictures, though. I was just looking at your tweets and you quoted Elf!!! Thats the only Christmas movie I will watch!